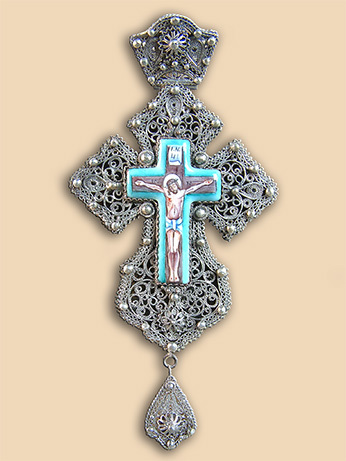 Pectoral cross in silver filigree with hand painted miniature icon on enamel of Jesus Christ. 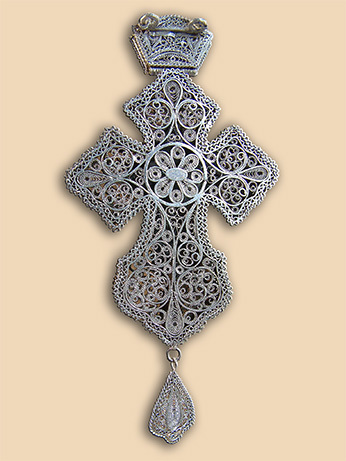 Size: cross 10.5 (17.5) cm×8,5 cm. Commissioned by: Author's gift on occasion of monastery's celebration of St. Prokopios. In possession of : Archimandrite Alexis (Bogicevic) Abbot of St. Luke Monastery, Bosnjane.